People like money. And people love wine. Though an exciting investment opportunity lurks in each bottle, if you know what to look for. For people searching for a simple, delicious, and timeless product to invest in, the clear choice is wine. Wine has emerged as quite the market for passion-driven investors and connoisseurs across the globe. The sophisticated set collect art to hang on their walls, but they collect wine not only to decorate their cellars with conversation starters, but also to drink, serve, and entertain guests. Both fine art and fine wine have an innate valuation unrivaled by anything else in the world. Simply put, people have a passion for wine, making it a timeless product that investors will forever feel confident putting money into. It truly is a liquid investment. Unlike love, wine itself is nothing complex: it's merely a bunch of fermented grapes grown in a variety of soils and climates across the globe. The genetics of the grape, various types of soil they grow in, seasonal patterns and the skill of the wine-maker all contribute to the success of any given wine. Regardless of the value of any specific wine, the idea of investing in wine for profit is more alluring than ever as this past year has been dominated by extreme market volatility while the demand for wine has been historically unaffected. In fact, studies show that wine purchases often increase in times of depression and recession. But if you really want to reap what you sow, Bordeaux is the way to go! The top 8 Bordeaux wines have historically offered the best returns across the spectrum of wine investment. One approach is to buy the wine before it's even been bottled. It's a Futures gamble where any type of recent currency fluctuations generally affecting the value of the wine can be compensated for – you get it before the price skyrockets when you buy it early. Wine's version of an IPO (initial public offering) is referred to as buying 'en primeur', or when it is first released onto the market. However, be wary because like the hyped tech IPOs of late, the price can tend to plateau after the offering is released. That's why Andrew Davis of the Vintage Wine Fund recommends buying wine between five and seven years after harvest. Fine wine appreciates especially quickly if weather conditions limit the quantity that can be produced each year. Then, global demand inevitably causes the most coveted bottles from the best vintages to rise in value as they mature and are consumed. "Prices fall when there is a surplus until the excess supply is gone. Prices rise when there is a shortage until the shortage disappears... The movement towards stable equilibrium is quite strong and predictable”, according to Mike Veseth at The Wine Economist. Be sure to pay close attention to the hard data. Keep a keen eye on the wine market and auction prices around the globe to find the best buying and selling opportunities. And remember, like any investment, there are no guaranteed winners. An ideal example is a 1961 Château Latour that was first sold at $3. Now, you can find a bottle at an auction going for $500. That means the investment returned just over 15% annually for 35 years. Not too shabby at all. In another example of a Bordeaux from a less successful vintage, a Château Latour from 1975, sold for $4 per bottle. Present day, you could still get that bottle for about $15 in auction. With an ROI of just 6.5% you would be much happier had you chosen the Château Latour from 1961 instead. A $35 dollar bottle of wine can easily sell for hundreds of dollars down the road, but you must do your due diligence to make that dream a reality. 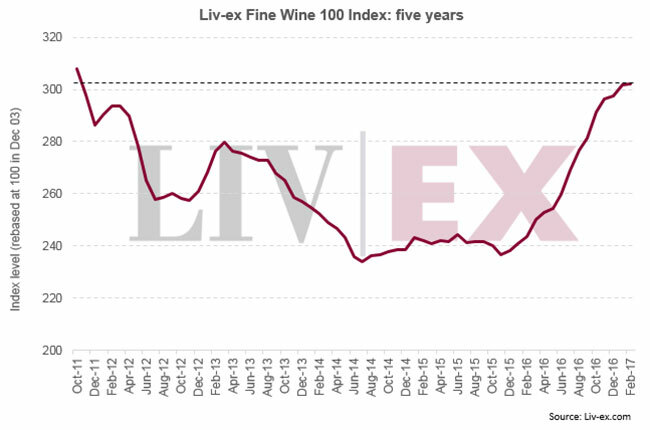 And looking at how the Liv-Ex Wine Index of the top 100 wines are ramping up. You may want to wait to buy on a dip or get in now, depending on the wine you're considering.